Our fun guide with a Kuala Lumpur business hotels review, some boutique beds and budget capsule transits at the airport. THE FIRST thing I normally do when I visit Kuala Lumpur, is to don my snorkelling gear. Then I head to my favourite curry shop and dive into the mutton masala, marvelling at juicy chunks of tandoori chicken and vast streaming strands of laksa noodles waving sinuously in a red chilli soup that packs enough punch to land a man on the moon. The only reason there are no Malaysians on the moon (though one astronaut turned up in 2007) is that people are entirely preoccupied with a) finding metered taxis, an endangered species especially when it rains, and b) finding anything, when neighbouring Indonesia spontaneously combusts as farmers burn the rainforests, creating a dense smoke haze that engulfs much of hapless Malaysia's west coast. Someone please toss a bucket of water on Sumatra and lock up the matches. Kuala Lumpur shopping presents mind-boggling options and stuff so cheap you'd expect EVERYONE to be here. Yet Kuala Lumpur business hotels remain surprisingly seasonal and regular discounts of 30-40 percent or more are perennially on offer. With an inviting exchange rate (US$1= RM4.15) and eye-popping five-star walk-in rates, there's no better time to visit. 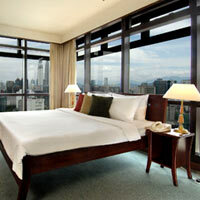 Four-star KL hotels are even more attractively priced and some offer a rather good room product. In which other major capital, barring Mogadishu, can you stay at a slick international property for just US$100 or less? Forget rack rates and corporate rates. Just ask for a “promo rate” and walk into the biggest hotel bargain east of the Suez. Kuala Lumpur is a bopping town with something approaching a sidewalk cafe culture, this despite the heat, the rain and exhaust fumes. At Bukit Bintang "sheesha" hubble-bubble stalls have proliferated offering flavoured puffs, Lebanese tidbits and chill-out music. The heat can be beat with the giant cooling fans that spray a fog of wet mist over diners. Have yourself photographed with a boa constrictor around your neck and marvel at cards handed out that say "For your pleasure, please call Addie..." Addie offered me a card every evening. I never had time to call. Kuala Lumpur shopping is diverse, vigorously showcased in the annual Mega Sales, hotels and hospitality are world class, transport is plentiful and food and nightlife teeming in downtown and newer suburban locations. June features a countrywide dance and culture extravaganza called Citrawarna, or “Colours of Malaysia”. What more could you want? Well, a few more cabs perhaps… Welcome to Malaysia, “Truly Asia”, as the catchy slogan goes. This is a country in rapid transition that has managed to combine funk and fervour, class and crass, technology and tradition, religion, romance and royalty, with aplomb. It is a heady cocktail, the results often unexpected. More for visitors at the hugely revamped and informative Ministry of Tourism website. Kuala Lumpur is a can-do city on the move. Once notorious for its gridlocked traffic, cars and people move too these days, thanks to some well-planned elevated motorways and light rail options. New highways snake in from the international airport. The monorail ride from Raja Chulan station (near the Crowne Plaza Mutiara) to KL Sentral is just 15 minutes. Short distances are a steal at just RM1.20. Taxis are plentiful, in theory, but are impossible to find when it rains and meters are rarely used. Cabbies figure the cost of the petrol expended in traffic jams far outweighs the meter fare and prefer, instead, to duck into the nearest coffee shop for a break. It tends to rain early and mid-afternoon. You might wish to hire a taxi by the hour (RM30 for a small taxi, and RM60 for a comfy premier taxi) to make sure onward transport is available. The MAS (www.malaysiaairlines.com.my) regional-route Airbus 330s are surprisingly roomy with decent pitch (which is legroom, as measured in the space between rows). Ask for bulkhead rows 11 or 29 for a really good stretch. The configuration is 2-4-2 so there are just two seats on the window side. Kuala Lumpur International Airport (KLIA) is large, glossy, and hassle-free. Immigration and customs is quick and getting to town is a breeze on the new KLIA Express. The quick and efficient 28-minute run to KL Sentral Station every 15 minutes costs RM55, about half of what a local cab will charge. Coupon airport taxis (or limousines, as they are called) charge a fixed rate of around RM180 from KLIA to Jalan Sultan Ismail. A less fussy regular vehicle will be under RM100. A little farther off, a separate, dedicated (LCCT, Low Cost Carrier Terminal) budget airlines terminal is running too. A few airlines, including MAS, Cathay Pacific and Royal Brunei, have check-in counters at KL Sentral. If you wish to dawdle at the airport put on your walking shoes to explore the factory-size MAS Golden Lounge, said to be the largest in the world at 43,284sq ft. That's a whole lot of lounge. Bang next to the KL Sentral station is the chic and contemporary 510-room Hilton Kuala Lumpur that emerged from a major renovation of public areas mid 2013. The lobby moves to pastels and earth tones with a lot of sensually curving chrome like in the cafe with its "toadstool" centerpiece with white-light piping creating space age silhouettes and spidery wall art. Rooms, starting at a very generous 44sq m, feature 42-inch plasma screen TVs, rain showers, ergonomic seating, and small swivelling LCD screens in the bathroom so you can stay tuned in to the Beeb or CNN. Ceiling-high sliding glass doors separate the bath from the bed. Rooms have an iron and ironing board. In-room you'll find a number of kits for kids and more. The Hilton lays claim as well to the city's largest free form swimming pool. This is a long snaking 600m affair wraps around one side of the eight-floor podium and is shared – along with the spa – by the adjoining Le Meridien (same owner, different management). There are several restaurants and watering holes – including the popular Zeta Bar – a two-storey fitness centre and a 1,220sq m "pillarless" ballroom. The Hilton lobby is minimalist but busy, spacious, soaring, light-filled and airy. Streetside cafeteria meets space-age lounge under the watchful gaze of large artistic renditions. The ringing echoes of conversation can be distracting for some but the ensemble creates a convivial, friendly atmosphere. Joined at the hip, so to speak, is the futuristic, but quieter, 35-storey twin, Le Meridien Kuala Lumpur, with panoramic views and extensive conference and meeting facilities. This sober version of the Hilton, with Moorish eccentricities, marbled floors with geometric inlays, and spacious rooms with muted colours was partially transformed November 2012 with a hip lobby with smooth grey pillars and a touch of bling from the bauble-adorned chandelier reminiscent of the Arabian Nights to the huge mood light screen behind reception. Hallucinogenic pop art covers the main entrance doors. New to the area is the Best Western Premier Dua Sentral with 357 spacious units, ranging from deluxe to one and two bedroom suites. There’s also a Presidential Suite with a kitchenette (minus cooking facilities) for the longterm staying guest. Crisply designed rooms feature standard conveniences such as hair dryer, mini bar and WiFi, LCD TV, iron and safe. 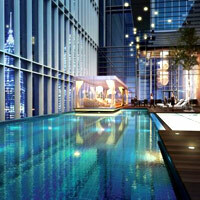 Like any 4-star accommodation, Dua Sentral is fitted with a pool, spa, gym and business center. The Best Western brand brings with it four reputable dining choice, including Hugo for Mediterranean cusinie and Grill 582 for meat lovers. The hotel’s close proximity to KL Sentral means you can purchase your ERL (express rail link) tickets at the concierge. Staff is friendly and helpful. Across the other side of KL Sentral station is Starwood maverick, the young-at-heart and gloriously indisciplined Aloft Kuala Lumpur Sentral, one of the bigger offerings for this newer brand in Asia with 482 rooms. Walk into a high ceiling lobby stripped bare of cover where iron foundry meets contemporary zen. Metal paint covers raw pipes and sensuously curving tubes that snake around raw cement walls. Staff will pounce on you to assist almost before you can step foot inside and this can-do attitude - with a smile - carries through on all floors right up to the rooftop Polynesian-theme bar and attractive open-air pool with mega-horizons on tap. The genial general manager, seamlessly switching caps at the lobby, showed me around, spright of foot in electric blue Dr Martens. This pretty much says it all. This is a hotel for the young and restless - but not down at heel. Aloft is priced to offer value but is not far behind the big boys on rates. A standard 33sq m room serves up a lot of deep blues, with a grey-blue carpet, flat screen TV, desk by the window with data-port and two three-pin sockets (including a multi-plugpoint), . Expect free WiFi, a small leather sofa, large bedroom switches, a sliding door leading to the bath with its power shower and hairdryer. The safe is laptop friendly, there is an iron and ironing board for stubborn post-party creases, and the mirror is bright. All in this is a tidy offering with walk-in access to city-check-ins for MAS and other airlines with a fast train straight to the airport. Pity the rooms are a tad Plain Jane though enlivened modestly by local art and wall cartoons. A stone's throw from here opposite the Old Railway Station, almost hidden behind clumps of foliage, is a coy historic gem that flashes its pearlies when the afternoon sun ignites its laundered white colonial outlines. 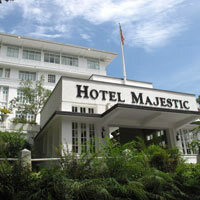 The Majestic Hotel Kuala Lumpur (rebranded an Autograph Collection pick from Marriot mid 2017, launched in its modern incarnation December 2012) has a vintage dating back to 1932 when the old wing, then simply Hotel Majestic - still emblazoned across the historic entrance - set up shop in the "heart" of town. It has since been joined by a linked Tower Wing that rises up to a rather modest height, despite its name, also kitted out in blazing white. 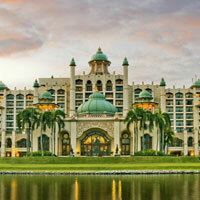 This is Malaysian regal splendour at its best with echoes of the Raj at every turn. YTL Hotels, which oversaw this classic, did a fine job in restraining designer ebullience to maintain a sense of the age, married in with contemporary trim, before handing over to the Autograph Collection. Walk into a soaring lobby (Tower Wing) with a vaulted ceiling and the Contango restaurant that does excellent and inventive buffet's with a new take on open kitchens. It is attractively priced as well, with Indian, Thai, Chinese, Malay and Western selections. The pizza is fresh and aromatic with none of that day-old sogginess that bedevils buffets everywhere. A Tower Deluxe room serves up a somewhat gratuitous four-poster bed that manages to hold its own in mod black wood without gauze drapes. This is perhaps the sole designer vanity here. WiFi is free and an L-shape tan sofa provides counterpoint to a generous bed with grey bed runner, black desk, and gold-and-charcoal tones. Decor is muted and well calibrated. Find a large flat-screen television, three three-pin multi-plug sockets for suits, and a sliding glass partition revealing the toilet with its black marble flooring, twin vanities, sensibly bright mirrors, and rain shower. There is a laptop-size safe and an an iron and ironing board for those who must get a razor-edge crease for that post-prandial stroll. A Junior Suite expands on the space while the Twin Room ensemble provides curtains to cover the glass bathroom partition. This latter format will work better for business travellers who would rather keep ALL their secrets intact. A Premium Suite has the living room in the centre with two bedrooms on either side. Walk past the glasshouse Orchid Conservatory where high teas are served; The Smokehouse with a pool table, beer, and cigars; the Screening Room where old black and white movies keep spooling; and the barbershop; on to the old Majestic Wing where dark timber takes over and things get clubby, very clubby, under a small gold vaulted ceiling. At the Colonial Cafe a jazz band plays nightly. Think drapes - lots of them - mosaic tile floors and deep sofas in the Drawing Room, then pootle on to gawp at irregular sized rooms with their black wood flooring, rich period furniture (no four posters here), cream carpets, burgundy flashes and striking black-and-white checked tiles in the bathrooms with their rain showers and claw-foot standalone soaking tubs. The Majestic Hotel Autograph Collection is no slouch at throwing a party either and can rustle up 1,200-pax banquets at its pillarless ballroom. Opt for a gala event or plan your next small corporate meeting or CEO chinwag here. This is definitely one for the diary especially if searching for a classy Kuala Lumpur heritage hotel. The St Regis Kuala Lumpur opened 1 May 2016 with 208 keys that will let you into rooms starting at a whopping 138sq m. Atop the ONE IFC mixed development tower complex, the hotel is smack in the heart of the emerging KL Sentral business district close to the station. Those still feeling cramped can opt for the 353sq m Royal Suite with its own kitchen, private lift, an outdoor terrace, and two walk-in dressers. Elsewhere, in-room expect a light colour scheme with powder blue carpets featuring small floral sprinkles, expansive white bed facing a huge wall-mounted flatscreen television and looking over open green vistas through floor-to-ceiling windows, complimentary WiFi, a rainforest shower, soaking tub, twin vanities, pillow menu for nervous necks and spoiling 300 thread count linen. If you don't wish to disturb those crisply ironed sheets, stretch out on the cream divan. There's ample space to pace or laze, languorously. Butlers are on call at all times to manage your travel tedium and set you up for that corporate meeting, wedding, or shopping spree. For CEO chinwags or larget corporate events there's 10,000sq m of function space including a grand ballroom equipped with an LED wall. Later retire to the Astor Bar or the rooftop for a breezy tipple. The hotel hosts its signature Iridium Spa as well as a fitness centre and outdoor pool. 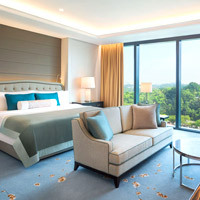 The Sheraton Imperial Kuala Lumpur Hotel has gone through major top-to-toe upgrades with a brisk new product offering 385 rooms including 27 Executive suites, two Ambassador suites and a palatial Imperial Suite. The Sheraton brand name is back, reassuringly, and taxi drivers and regular punters will beam as they have always referred to the property as the Sheraton Imperial despite several stop-and-start name changes. Everything gleams from the sparkling lobby to the new rooms. Staff is attentive and quick. Expect 44sq m rooms with bathtub and separate shower, walk-in closet, 40-inch LCD TV that anchors your audio-visual work and play, and a Sony DVD player. Pick from a Twin Towers View Executive Room, a Club Room with business-floor amenities and 24-hour butler, an Executive Suite, or the humungous two-bedroom 336sq m Imperial Suite where there's room to swing a horse by the tail, and more. While the restaurants have all come alive with a contemporary design and fresh purpose there is muted emphasis on after-hours revelry, partly on account of the hotel's excellent location amidst a popular nightlife hub along "Heritage Row", a good enough reason to visit this fine business property. Still, for fine dining there's few better choices than the Tuscany-inspired Villa Danieli for home-style Italian. The hotel, now carrying the much prized "Luxury Collection" tag, is a crisp businessman's retreat with in-room Broadband. Enjoy the airy four-storey atrium lobby, the sunny swimming pool, or the hushed interiors of the spa. This hotel is a good pick for conventioneers too. 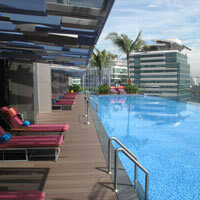 It is by a long chalk among the best Kuala Lumpur business hotels, and not just in the vicinity. Service is always on the ball with staff leaping up to assist any unattended guests. Starwood is flexing muscle anew. There’s Four Points by Sheraton (late 2014) in Puchong) with 249 rooms including 12 executive suites; and another Le Meridien in Putrajaya with 350 guestrooms. Also in the pipeline is Sheraton Petaling Jaya Hotel. Right around the corner from the Sheraton close to Heritage Row and its hip bars and restaurants is Hotel Stripes Kuala Lumpur, also a member of Marriott's Autograph Collection, the second in town after The Majestic. The Jalan Kamunting strip is an old urban district (originally for tin-mine workers) with pedestrinaised areas and low-rise shophouses offering plenty of character for visitors. In-room expect cream pastels with woody tones, large black-and-white old photos behind the beds, tall louvred windows with plain white chintz drapes, work desk, coffee machine, free WiFi, large HDTV, complimentary mini-bar, textured carpets and dark marble trim. It is contemporary chic for the leisure traveller or businessman on the go. The rooftop pool with its bar is a splendid spot for sunning and breezy views while a fitness centre is on hand for exercising stiff office limbs. Launch rates June 2017 were as low as RM247 (around US$58). Jalan Sultan Ismail is KL’s main drag and the city’s top hostelries are arrayed along it (or off it) like starving barracudas waiting to pounce. Prices are extraordinarily flexible. Walk in and you will be mauled by beaming receptionists all happy to quote their best current promo rate. The mature Shangri-La, Kuala Lumpur at one end of Jalan Sultan Ismail has had a lavish makeover, top to bottom, with new exterior cladding. The hotel has completed a yearlong renovation – expect 662 luxurious rooms including 101 suites with sumptuous furnishing. The lobby gleams with black marble, dramatic uplights and a green cut-glass centrepiece. It is spacious, completely over the top, and of course, very much the place to see and be seen. If you care to pay the rack rate, you are entitled to complimentary airport limousine transfers, complimentary laundry and dry-cleaning, breakfast and free Broadband Internet access. In-room expect flat-screen TVs, while the comfy Horizon Club Lounge (relocated from Level 28 to Level One) for business travellers on the go offers personalised check-in, complimentary breakfast, a separate wide-screen television room and, yes, a smoking area. The business centre has five Internet stations with Broadband. There's even a new room category – the Premier Selection Suite with 58 units, most equipped with walk-in dressing area and a personal bathroom TV. To soothe the eyes, the hotel offers lush gardens. Service is brisk, intuitive and quick at this re-energised venue. The Shangri-La is among the top Kuala Lumpur business hotels. Best of all is the steady stream of premier taxis so business travellers are rarely stranded, and a monorail station is close by. The train is a useful option as traffic is intense at peak hour along Jalan Sultan Ismail. Close by is Jalan P Ramlee, a dizzying first encounter for any newcomer with its high-octane nightlife, where the soundtrack swings from ’80s pop and techno to hip hop, R&B and trance. Right across the road is the steadily upgrading Concorde Hotel, a staple four-star that gets its share of saucy nighttime revellers spilling over from the Hard Rock Cafe as well as neighbouring Jalan P Ramlee. Business travellers should opt for the Premier Executive rooms, which are functional and comfortable. There is a small working table, VCD player, an iron and ironing board, a set of three-pin square plugs and a deep European socket, near the table, and a sensibly large clock. Expect a flat-screen TV and an inviting bathroom with separate tub and shower. The small safe will not hold a laptop. Premier Executive rooms are spacious with leather reclining chairs, generous toilets, and a flat-screen TV with DVD player. Twenty-five newer Classic Suites on the eighth and ninth floors offer a cocooned, spacious, and mod environment, minimalist, with faux-European flourishes including bright red high-back chairs in the lift lobby and black and white wall tile cameos. Rooms offer earth tone carpets, soft leather headboards, a plump bed with bursts of pink cushions, a large glassed-in balcony/alcove welcoming of light and sun where you can settle down for a good read. The in-room safe is flat and large enough to house any laptop you care to throw at it, the toilet is mod, and olive floral wallpaper completes the "classic" mix. Premier rooms and above come with free Broadband via WiFi. For those less fussy, standard rooms are a steal. At the end of the day, the Relaxa Health Centre will bring a happy flush to the most hardboiled executive cheek. The same group also runs the Concorde Inn Kuala Lumpur International Airport and the Concorde Hotel Shah Alam. Come evening and the Concorde KL lobby is rocking with loud music and drinks being bought by the gallon at the Crossroads bar. And do check out the excellent Xin Cuisine Chinese restaurant for interesting dim sum. The once popular and stately, if graciously ageing, Regent has metamorphosed into the spit-and-polish Grand Millennium Kuala Lumpur. The lobby gleams with black marble and ample gold trim just in case you missed the point. The property is on Jalan Bukit Bintang where you’ll find a rash of lively eateries, bars and shopping malls. Staff is perky and attentive to guest needs and the place has a spring in its step as expected of a newcomer. This more than compensates for the unremarkable exterior. The 468-room hotel offers Broadband at RM60 per day. Spacious 40sq m rooms feature muted pastel colours and floor-to-ceiling windows that are welcoming of light. Expect a small in-room safe and a 32-inch flats-screen LCD TV with all the usual satellite goodies. Studio Suites weigh in at 55sq m while the Executive Suites are a generous 80sq m. While this is among the better Kuala Lumpur business hotels on the block, with 15,000sq ft of meeting space to boot, the property caters for kids too with baby-sitting services, cots and more. Keep an eye on this as a Kuala Lumpur conference hotels choice for corporate meetings and mid-size gatherings. Right round the corner is the trendy Wolo Bukit Bintang. This boutique hotel has got everything going for it – great location, cool interior and enthusiastic service. You’ll have to pass a bakery, and take a lift up to the reception to check in. Be prepared – rooms are tiny, starting at 18sq m (and windowless) for RM265 and for RM470, there's the family room at 48sq m with two king-sized beds. All rooms have en-suite bathrooms. Note: beds are just mattresses placed in a depressed wooden platform on the floor. So do specify if you want a queen bed as you won't be able to move single beds together. The hotel has 138 rooms but only 115 are currently open. Room rates come with free breakfast at the bakery, Tous Les Jours. Check out the art at the lobby, which doubles as an exhibition space. There’s a workout room, a plush Wine & Cigar lounge and meeting room; but no pool. The Raffles Kuala Lumpur was tentatively planned for a location within Pavilion Kuala Lumpur. This 200-room hotel (with rooms starting from 50sq m) would, if and when executed, feature six restaurants and bars plus the signature Raffles Amrita Spa. Just across the road is the very corporate The Westin Kuala Lumpur with its trademark "Heavenly Bed" and the popular streetside Qba Latino grill and wine bar. Pasta by the yard comes delicately spiced at Prego. The Westin has 443 rooms and an Executive Residences section as well. The 42sq m Deluxe Rooms offer views either side of the city, or the trademark Twin Towers. WestinWORKOUT Rooms serve up in-room fitness options ranging from dumbells, and cycle or treadmill, to yoga mats and assorted fitness paraphernalia. Expect Broadband, a workstation, inroom safe, CD/DVD player, hair-drier, and work amenities. After-hours work up some sweat at the Westin Workout Gym. Later slough off the sweat with the invigorating force of – well, what else? – a "Heavenly Shower". The Westin is a well located Kuala Lumpur business hotel – with large Executive Residences for longstay visitors – but also keeps an eye out for the guests of tomorrow. Kids from three years and up can park at the Westin Kids Club where a slew of heavenly activities await. The marble and pale pine lobby is unusually compact but light and airy with an intimate feel to it, the entire ensemble set off by bright mood lighting. The JW Marriott Hotel is a central Kuala Lumpur business hotel choice though it makes an excellent leisure pitstop too, based as it is, cheek-by-jowl with some of the best shopping in town, including the immensely popular Starhill complex. Swank Dior and Louis Vuitton stores are right next to the hotel's lobby. The hotel is went through a comprehensive top-to-toe refurbishment and emerged with a new look 5 December 2017. WiFi is free and now expect a contemporary feel in-room with flatscreen televisions, mirrors, plenty of fabric and textures and a corporate pastel palette. The lobby, slathered in marble, is minimalist, less crowded and more contemporary. A 40sq m Club Executive room offers soundproof windows, floor-to-ceiling windows, rust brown carpets and wall panels, sofa, writing desk, SONY alarm clock and in-room safe. Expect a separate shower and bathtub in the washroom with hairdryer and bathrobes. Also check out the Starhill Spa Village with its arsenal of wraps, scrubs and aromatic oils. There's a plunge pool, massage, and a steam room. Alternatively, sweat it out at the Fitness Centre. The JW Marriott KL has more dining options than you can shake a stick at but standouts are Shanghai, for unbowdlerised Chinese, and the open-kitchen Shook! restaurant. The neighbouring Ansa Kuala Lumpur (formerly Piccolo Hotel), a clean, white mid-rise, is positioned as a Kuala Lumpur boutique-style hotel with just over 160 rooms and a splendid shopping-epicentre location in Bukit Bintang close to the JW Marriott. Premier Deluxe rooms feature stylish flourishes, dollops of bright anemone and coral art, pastel colours, 32-inch flat-screen TV, iron and ironing board, free WiFi, and a boxy in-room safe that will just about manage a notebook. Pale wood tones run throughout the decent sized room (city views from the 11th floor and higher), and there is a narrow work desk with two three-pin (including a multi-plug) sockets. The bright painting sets the tone for the whole room. It would all be utterly brilliant were it not for the whimsical washbasin marooned at one end of the room with nary a mirror nor light. Still it is fun to splash about and some rooms do have a make-up mirror in the shower cubicle (with a rain shower). Fortunately the cupboards feature full length mirrors so it is possible to shave on the fly. Just toss some towels on the floor to absorb any drip. If you need more stretch room opt for an Executive room or Suite. Later unwind and have a bite or coffee at Greyhound Cafe Malaysia or Starbucks Ansa. This is a smart, friendly, clean and affordable hotel offering good value in Kuala Lumpur with an unbeatable location next to shopping, restaurants, nightlife, and a monorail station. Staff is welcoming and responsive. Definitely one to look out for. The Ritz-Carlton is a small, boutique affair with 251 rooms (including 30 suites) and classic lines. No soaring lobbies, just an intimate reception area and earth tones. The place has got a smart new look and by late 2016 sported a contemporary feel, moving modestly away from the plush classic look of yore. Rooms are more woody and corporate now. Deluxe rooms start at 430 square feet with plush beds, workstation, high definition flatscreen TVs, and WiFi. The Club Premier Suite weighs in at a roomy 893sq ft with over-size pillows, marble bathrooms with rainforest showers, DVD/CD players, flat-screen TVs and iPod connections. Euro-nuts will enjoy the acres of dark, chiselled wood and sombre oil paintings with large gilded frames. The speciality here is the butler-drawn bath, for all rooms. If things get a tad steamy, remember, the butler did it. The bar is a suitably chaste deep leather seat affair with hushed lighting. At the adjoining The Residences (also from Ritz-Carlton), check out a 1,918sq ft executive suite. An added attraction at this understated Kuala Lumpur business hotel, is its Spa Village where pinstripers can wind down with massage and wellness treatments. Just opposite is the 322-room Dorsett Regency Hotel, an unpretentious but decently equipped place with rates that bordered on ambitious has returned in 2017 after a two year refurbishment with bright functional rooms and WiFi. The pricing may be a tad aggressive but negotiate hard. There's 30 percent off the best available rate for direct bookings till end December 2017 to mark the relaunch. It’s a good location and guests – many from Hong Kong – love the place. The hotel also runs the Dorsett Regency Service Apartments a short walk away. Not far from here on Jalan Imbi is the 300-room Melia Kuala Lumpur with neat, pastel-shade rooms offset by bright bed runners and sofas. Close by, the former Japanese-run Prince Hotel & Residence changed hands in 2015 to become the Hotel Pullman Kuala Lumpur City Centre Hotel and Residences. Quite a mouthful. It is a green reflecting glass twin tower with a shared pool. It is cool, minimalist and neat. Hotel rooms feature light pastel hues. The impression is Spartan but the space is functional and comfortable. WiFi is free. A very nice touch is the steam irons and fold-out ironing boards in all rooms. There are coffee and tea-making facilities and a 48-inch flat-screen TV in the all-white 54sq m Premium Deluxe Corner rooms with king-size beds. The in-room safe can store a laptop quite easily. But then, where will your mother-in-law stay? The hotel’s Deluxe Executive Rooms feature curving panoramic glass walls with generous views. The second tower houses the apartments. Moving away from mod and minimalist, newbie Royale Chulan Hotel and Residences revels in traditional Terengganu architecture. It's a happy combination of handcrafted wooden elements, lotus-shaped chandeliers, sweeping staircases and indoor fountains. Guests arrive through a glassed-in courtyard conservatory. The fifth floor Royal Club Lounge offers discrete, professional service, two private meeting rooms, personalised check-in and Internet access for corporate guests. Club rooms are attended to twice a day – in the evenings an ice bucket, water bottles and glasses are placed at the bed stand (a nice touch). With 300 rooms and 95 apartments plus a ballroom that seats 2,000 and 18 meeting rooms, this could very well be the choice hotel for MICE travellers. Mark this one down for your Kuala Lumpur conference hotels list should you have a meeting in mind. The hotel opened in 2009 and has steadily ironed out glitches. Plus points – above par service, wonderful rooms with spacious bathrooms, two good restaurants, sumptuous breakfast spreads and value for money deals. Most cabbies are still clueless about its location, however, so simply direct them to drive past the Prince Hotel if stuck. The centrally-located Crowne Plaza Mutiara did a Michael Jackson on the grey, cinder block that was the former Hilton and then succumbed to the wrecking ball. It re-emerges as an office block. Goodbye hotel. But pin-stripers will have a new hotel to look out for in 2018 – the seven-star Harrods Hotel located between Jalan Raja Chulan and Jalan Conlay. The evergreen 426-room Parkroyal Kuala Lumpur (formerly run by an Australian group) offers friendly service and a handy central location. The hotel went through a major facelift to emerge in pleasing earth tones with many attractive touches. Deluxe rooms come with a king-size bed (or two queens), laptop-size safe, Broadband, flatscreen TV and a steam iron to get your suit in shape for the next day. Levels three to six are exclusively the Orchid Club domain, with 78 rooms. A glass bubble lift whisks guests directly from the hotel lobby up to the Orchid Club Lounge on level six. Room sizes range from 30sq m to 72sq m and exude a cool vibe with 32-inch Sony LCD televisions with attached DVD players, free Internet usage, and large bathrooms with separate bath and shower facilities. Guests enjoy personalised check-in and check-out services, complimentary breakfast, tea and coffee as well as evening cocktails at the Orchid Club Lounge, complimentary daily pressing and laundry and special discounts at St Gregory’s Spa (located on the sixth floor) offering treatments ranging from aromatherapy facials to Javanese massages. And in the shadows of the sky-piercing Petronas Twin Towers (when the sun occasionally emerges from the KL haze) are the humming Mandarin Oriental and the very chic Ascott executive apartments. Both offer easy access to shopping and convention facilities and good standards of service. The Ascott, on Jalan Pinang, commands excellent views of the city as well as of the towers, especially from its 22nd floor Sky Lounge and pool deck. Hop into the turquoise Jacuzzi and lean dangerously over the city lights, drink in hand. This is also where the fitness centre and spa are located. The lobby is small, yet bright, airy and elegant, offering a real sense of home. The rooms however are enormous, ranging from 613sq ft for an Executive Studio to 3,143sq ft for the four-bedroom Royal Penthouse. Cruise wireless Broadband at the pool deck, the Sky Lounge or lobby. Ask also for The Ascott's business packages which, when available, offer a range of useful extras. Ascott offers lots and lots of room smack in the heart of town right next to nightlife, bars and shopping. Close to the Twin Towers, parks and fountains, and the busy KLCC shopping and restaurant complex is the renovating Mandarin Oriental Kuala Lumpur. This is a gleaming building with fine rooms and great views and the revamped Pacifica Grill & Bar is a trendy haunt. But it's the staff that makes this place special with ever-ready smiles and accommodating service. Among the crispest Kuala Lumpur business hotels, it offers spa facilities, tennis and squash courts and a sunny pool looking onto lush parklands. Being right next door to some of the best shopping in the city has its pluses. Check for special shopper discounts and specials for inhouse guests. Pick up discounts of five to ten percent purchasing items through the Mandarin Oriental's "Lifestyle" programme, at places like Aigner, Calvin Klein, Armani Exchange, Max Mara, Bally, Versace, Nautica and more. The top seven floors of the hotel house the Mandarin Oriental Club's 148 spacious rooms with stunning views and thoughtful executive amenities like complimentary dry-cleaning and Wireless Broadband. All its rooms, suites, Club rooms and apartments have had a major refurbishment. Opt for city views or park views, either way, there's open vistas galore. Or insist on rooms with the Petronas Twin Towers view. In the spacious Club Suites, expect a classic living room with DVD/CD player, ergonomic adjustable chairs and table lamps, iPod docking stations and a handy fax to keep your work humming. Find a well equipped kitchenette and a huge marble bathroom boasting double-head showers, sauna and whirlpool and TV. This hotel fares well on our Kuala Lumpur business hotels review. The Grand Hyatt Kuala Lumpur opened late August 2012 at the KLCC convention centre, equi-distant from both Mandarin Oriental and Traders. As the first Grand Hyatt in Malaysia, and a much awaited one at that, it will not disappoint. Walk in to enjoy soaring ceilings, grey-veined white marble floors (not the signature black this time), and a light airy feel welcoming of light. A spiral staircase leads up past the conferencing area with a mammoth 3,300sq m of meeting space, and hushed elevators whoosh you up to the 39th floor eyrie where jaw-dropping 360-degree views await at the main lobby and check-in. One of the first things you'll see are the Petronas Twin Towers - up close and personal. The hotel's 412 rooms start at at roomy 47sq m with floor-to-ceiling windows that yield panoramic views for the most part. A Grand View room serves up a white marble foyer with rich timber underfoot in the bedroom. A cream carpet frames the plump and inviting bed with large, tactile, eminently sensible room switches and three-pin multi plug sockets at either side. There is a classic clock on the bedside table. This is a no-fuss arrangement that will please many. Expect a large flat-screen television, a glass work desk with two three-pin sockets (one is a multi-plug). A large glass panel behind the bed shields the bathtub with the ability to turn opaque at the press of a button. The toilet is large and bright with a big basin and well-lit mirrors - though there is a separate mirror with make-up ring lights in the dressing room as well. There is a rain shower to slough off the KL sweat apres-conference - or shopping - and a walk-in alcove with a laptop-friendly safe and iron and ironing board. The 65sq m Grand View Deluxe is a corner construct with added stretch space and views from the large toilet and bathtub. It is a thoughtful ensemble and if there is a minor niggle it is that WiFi is charged - at RM68 a day (for up to three devices). For exercise and wellness boffins there's an attractive outdoor free-form swimming pool (always kept to 28 degrees Celsius and with plenty of sunshine but overlooked by several buildings, alas), a fitness centre, and the Essa Spa. Walk right into the Kuala Lumpur Convention Center, stroll through the park, or pop into Suria shopping mall. This is a central downtown location with brisk and attentive service. The Grand Hyatt is already setting new benchmarks as one of the best Kuala Lumpur business hotels, with a price to match. 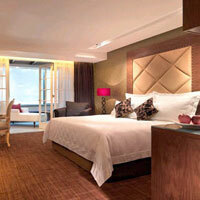 A young spark is provided by the smart 571-room Traders Hotel Kuala Lumpur (by Shangri-La). This gleaming mod property is not just smart on looks, it is smart inside, packed with bright splashes of colour, modern art, and mood lighting. Groups check-in on the first floor where a Wireless reception can be set up whenever necessary. This gets the crowds away from the normal check-in area on Level 5. This level also houses the cafe, GOBO Chit-Chat Meet and Eat - quite a mouthful but then, it does serve an extensive buffet. On Level 6 is the cosy lounge with wraparound views of the Twin Towers. Broadband Internet has to be paid for in-room but WiFi is free on Club Floors and in the Club Lounge. The business centre offers Internet access as well as a funky game station complete with steering wheels for avid racers. Bathrooms are well lit with bathtub, shower and a weighing scale. No rubber ducks here, just a lollipop which works well for him and her. Expect chic minimalist and mod rooms in earthy pastels, an interactive LCD TV, a low sink-in chair, iron and ironing board, a laptop-size safe, and a work desk with three easy-to-access plug points (3-pin square). Space is well used and everywhere there are cinematic views across the city, or the park (beyond which, the Twin Towers gleam). The rooftop Health Club & Spa offers breathtaking views and breathless fitness regimens for all sizes and tastes. 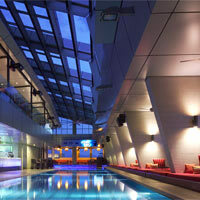 Up here, by the long alfresco pool, the SkyBar is a chic after hours rendezvous with breezy snuggeries and great views. The downtown KLCC location is a useful asset. This places Traders Hotel right next to the city’s green “lungs” and jogging track, shopping, and offices. Transport options are plentiful. From the PuLi Shanghai group comes the elegant slimline and understated The RuMa Hotel, Kuala Lumpur City Centre (2018) sporting much of its sibling's grey pastel woody DNA. Located on Kalan Kia Peng with views of the KLCC and the Petronas Twin Towers, this is a luxury bolthole for both business travellers and leisure trippers in search of an urban resort feel. Think wooden floors, cool throws, dark stained wood panels, window divans, large blinds, local texture, and clean zen lines. From the activity hub at Level 6 enjoy panoramic views of the city centre, a heated pool, wading pool, spa, pool bar and Jacuzzi. The prime design motif is a lack of clutter and memorabilia. This is a contemporary space for the discerning and among the new KL luxury hotels to keep an eye on. The 12-level hotel offers 253 suites including Grand Suites and a Presidential Suite. KL prefers everything bigger, taller and longer so it comes as no surprise that the world's tallest Four Seasons Hotel, The Four Seasons Kuala Lumpur (early 2018), stands shoulder to shoulder (well, almost) with the soaring Petronas Twin Towers. A little behind schedule, the RM2.5 billion project (backed by tycoons and royalty) comprises a single 65-storey building that tapers at the top, closely resembling the towers next door. This is twinned with a 242-room Residence. On this Kuala Lumpur luxury hotels review, Four Seasons promises to be among the best, with quality finish, views, and facilities. Expect a rooftop pool bar with panoramic views and varied dining including Cantonese fare. The young and sparky 150-room W Kuala Lumpur (mid 2018) features 1,200sq m of meeting space, one ballroom and five meeting and function rooms, a fitness centre, food and beverage outlets, a full service spa and a nail bar. The W KL is located on Jalan Ampang, across from the Petronas Twin Towers and not far from the Kuala Lumpur Convention Centre. The hotel lobby is located at the top of the building – guests ride express elevators for check-in while taking in the impressive bird’s-eye views of downtown KL. Expect the usual textures and bright red divans in the rooms. In the same vicinity, the Impiana group flagship, the Impiana KLCC Hotel is a 519-room straight-up business hotel with a good location for leisure trippers. This is a value option for those shopping for well positioned KL conference hotels. The four-star hotel offers all-day dining and a brisk business centre. While the unfussy exterior (inherited from Holiday Inn) has undergone useful cosmetic changes, the interiors have sparked to life and the rooftop infinity pool looks out over the twin towers. Stop by Cedar on 15 for some contemporary fare to see how far this address has really evolved. A Club Deluxe offers a black marble entrance foyer with earth-tone carpeting in the bedroom, an ergonomic chair and an oval glass desk with free WiFi and two three-pin multi-plug sockets and one three-pin square. There is a flat-screen TV, and muted wall paintings watch over large bedside switches, and the easy chair with an Ottoman for tired feet. The pillow menu with eight different types of pillows to choose from is an inspired touch. Also find a hair-drier, an iron, and an electronic laptop-friendly safe with three-pin power socket. Indeed electric sockets abound. Manna from heaven for geeks and the gadget entangled. The bathroom is in black marble with a rain shower. Close by is the Hotel Novotel Kuala Lumpur City Centre, close to the KLCC, with 291 rooms, an executive floor, a fitness centre, spa and pool. The Renaissance Kuala Lumpur Hotel offers good facilities for business travellers and leisure trippers. The east wing at the Renaissance offers a different room structure – only superior rooms here. It is cheaper and contemporary with a younger flavour while the west wing is more conservative (think black marble and crystal chandeliers), appealing to business travellers. Both wings share an Olympic-size pool with sunning deck and plenty of green. Work up more sweat at the well-stocked gymnasium or on the all-weather tennis courts. A spacious Grand Ballroom – easily accessed from either wing – offers a plush and modern venue for banquets, conferences and conventions. In the basement here is a prime gentleman's distraction – the Club de Macau. The centrally located Hotel Istana sports black marble, geometric lines and beaded chandeliers giving the distinct impression of a Middle East locale. The property would have done well in Dubai circa 1970, but modern KL has been a lot more competitive. Still, a raft of substantial upgrades at this old address, including the Malay-style Sompoton Spa, a broad range of refurbished dining outlets, smart accommodation, and extensive meetings facilities have brightened things considerably. The Suites feature wooden cupboards painted white, silk earth-tone bed runner, complimentary Broadband, DVD player, a flat-screen TV, iron and ironing board, and a positively giant in-room safe. You can park a lot more than just your computer in this. There's two three-pin square plug sockets for executive travellers or those with a load of gadgets to recharge. WiFi is free in public areas though regular rooms will attract a charge for Internet access. A singular feature of this elderly, yet rejuvenated, hotel is its huge rooms. There is space everywhere you turn. The brand is making up for lost time – and there is work to be done for sure – but the Hotel Istana is back in the fray with a terrific central location. Business and longstay travellers, take note: the Parkroyal Serviced Suites Kuala Lumpur has expanded options and offers a home away from home. Its 287 studios, with soothing tones of brown and sage, are spacious (ranging from 603sq ft. to 1,033sq ft. for a two-bedroom deluxe) with plush lounges, open interactive kitchens, LCD TV, Wi-Fi, personal safe, iron and ironing board, large bathtubs and separate showers. Other plus points include daily housekeeping and breakfast, in-room dining, self-service launderette, sheltered parking, rooftop pool, business and fitness centres. There’s also a resident’s lounge and library. Service extends to getting your grocery shopping done for you. A nice touch indeed. Another excellent option for business travellers scouring longstay KL hotels and serviced apartments is the Fraser Place Kuala Lumpur on Jalan Perak. Expect fully serviced residences with 215 studios, one and two-bedroom apartments and penthouses, with postcard-perfect views of the city skyline. Rooms reveal hushed modern spaces with Simmons beds and rain showers. A second property opened in 2013. Fraser Residences Kuala Lumpur meets the needs of long-term and short-term guests with its fully furnished 446 serviced suites. Each is fitted with sleek interiors, a comfortable living room, a fully-equipped kitchen and en suite bedroom. Smart and modern, newbie Lanson Place Bukit Ceylon Serviced Residences (2014) has opened its doors to business travellers and long-term guests with all the comforts of home and hotel services plus one extra – grand views of the KL skyline. Check into any one of its 150 units (one to three bedroom options available) and enjoy amenities such as flat screen TV, iPod docking station, rain shower (with GilChrist & Soames bath products), plush bedding and a kitchen complete with electric stove, dishwasher, microwave, oven and coffee machine. Each room is bathed in natural light, thanks to its floor-to-ceiling windows, and has an overall warm palette. There’s also an Olympic-sized pool, a full-service gym and a sky lounge for cocktails. Nearby Invito Hotel Suites is your home away from home. Stylishly furnished and adequately equipped, each suite is lavish and spacious. Stay at its studio deluxe (411sq m) or studio executive (453sq m) that starts at a promotional rate of RM250. For almost double the price (RM530) you’ll relish the extra space - 927sq m in all – in a two-bedroom exec. All 126 rooms are fitted with the usual mod-cons. Be sure to request for a room away from the Changkat Bukit Bintang strip as it does get noisy especially on weekends. There’s also a pool and gym. The star attraction is the very funky Hubba Hubba at its entrance– a great stop for fusion cuisine, and cocktails. On Jalan Ampang’s “embassy row” and a short walk from the KLCC is the Doubletree by Hilton Kuala Lumpur. The forgettable Crown Princess Hotel has undergone a multi-million-dollar redesign and to rebrand as Doubletree. The 540-room hotel now pays homage to unstuffy modernism, with an efficient and elegant meeting facility and four buzzing restaurants and bars. With a location just off Jalan Ampang close to embassies, offices and not far from the KLCC,Lanson Place Ambassador Row Residences, Kuala Lumpur offers a homey feel for KL long-stays and also serves up short-term rates for hotel guests in need of a more residential ambience. The one, two or three-bedroom units serve up unfussy, cheerful decor in 600-2,000sq ft of living space with LCD television, hairdryer, iron and ironing board, safe, and a pretty decent kitchen with fridge, microwave oven, electric range and utensils. Also find spa services, cafe and a spa. This is a useful address among Kuala Lumpur longstay hotels. Within a quiet part of the U-Thant neighbourhood (just behind the US Embassy on Jalan Tun Razak) is an interesting offering, Villa Samadhi – a collection of 21 distinctive plaster, wood and thatched-roof villas. The villa’s entrance is discreet; step inside – the chaos of KL melts away and rooms are whisper-quiet. Villa Samadhi is KL’s first intimate villa-in-a-room concept that pairs clean lines with salvaged-timber floors and polished concrete interiors. Each has a grand bed, oversized plunge tub and hi-tech amenities; some come with modern kitchens and private gardens. Large rooms (from 600sq ft to over 2,000sq ft) lead to outdoor Jacuzzis and showers, and sliding doors off bedrooms (on the ground floor) frame the pool that’s surrounded by tropical greenery. The compound includes Mandi Mandi for all day dining and Bumbung, a rooftop tea lounge. Villa Samadhi is spanking new, so for now, you’ll feel like you’re the only one at this exclusive retreat. Staff is attentive and friendly. In a world of cookie-cutter boutique hotels, Villa Samadhi makes a strong stab at bespoke stays. Adjacent to the Doubletree, the highly contemporary GTower Hotel (opened March 2010 as G City Club) cleverly combines the technology of an office with the comforts of a guest room. It's a Kuala Lumpur boutique hotel for business travellers, comprising 180 rooms, with promise of high-speed Broadband, WiFi, IP telephony, IT concierge, business secretarial services and access to the penthouse private club. The bridge bar and rooftop restaurant attracts a very lively evening crowd. Next door, the InterContinental Kuala Lumpur has taken over the former Hotel Nikko.Externally it is much the same but a major refurbishment of the hotel’s rooms, Japanese restaurant, concierge lounge and hotel lobby has wrought some startling changes. The lobby has moved from cream marble to a contemporary space with steel and chrome touches. A Grand Premier room serves up a bigger-than-kingsize bed (to suit American sizes perhaps), a cream leather headboard, plenty of stretch space and cool pastels. Find an iPod dock, a large swivel flat-screen TV, free WiFi, a dataport, with two multi-pin sockets, a grey lounging divan, and a see-through glass partition bathroom with separate tub and a rain shower for sloughing off that jet-lag. Also expect a CD, DVD player, an ergonomic chair next to a glass work table, an iron and ironing board, and a bottom pampering Japanese potty. The only niggle might be a smallish box safe for jewellery if not laptops. The plump white bed is inviting and roomy. Rooms are bright and welcoming of light. Hotel facilities serve up everything you might expect of an InterCon – spacious meeting rooms and event facilities, business centre, gym, pool and spa. Staff is eager to please. Just remember to direct taxi drivers to the old Nikko; many aren’t aware of the switch. Not far away, the erstwhile Radisson, now simply, Hotel Maya, has graduated from a package-tourist haunt to an exceedingly pleasant boutique hotel aimed at individual travellers, corporates and discriminating leisure trippers. Wander in from the main road and you might be excused for thinking you've barged into Lord of the Rings IV. The restaurant ensemble here is all magic waterways, crystal rocks with twinkling lights and a black corkscrew staircase that twirls up to the second floor lobby. Yes, the taxis can go up too. Bamboo screens line an alluring dark tile pool looking onto a bright splash of greenery while hydro jets massage away the day's aches. The Hotel Maya is fully WiFi enabled and it's FREE. In-room Broadband access is free too. Rooms are chic with wooden parquet floors, dark wood, straight lines, and a distinctly contemporary Zen feel with splashes of colour. The large bathroom with a sit-down stool to enjoy the rainforest shower, has a full-height glass wall so you can watch TV while you bathe. There's a DVD player. Bring your own discs or borrow some from the library. The funky work desk at Hotel Maya is mounted on rollers so you can slide it back and forth to maximise space. Executive travellers will be pleased to note the inroom safe can easily handle a 15-inch screen laptop and it comes with a recharging electrical socket. Look out for the dedicated inhouse spa. In the suites, the minibar is replenished daily - and charged to the house. Drink up. It's free. This reborn property is a great Kuala Lumpur leisure or business hotel choice with panoramic views of KL Tower and the Petronas Twin Towers. While it has a fair number of rooms and an undistinguished exterior it justifiably strives to be seen as one of the best Kuala Lumpur boutique hotels. The centrally positioned Berjaya Times Square Hotel, Kuala Lumpur on Jalan Imbi offers over 650 furnished suites with Internet access in several rooms, separate living and dining area, and laptop-size safe. There are seven suite styles ranging from the 51sq m Studio Suite to the 99sq m two-bedroom Brooklyn Suite. The hotel has undergone a much-needed facelift. The new ground floor lobby is welcoming – contemporary, without much clutter and comes with separate check-in counters for the convenience of FIT and corporate guests. Gone are the drab clubroom interiors, in favour of lighter wood, more space, LCD televisions, crisp white linen and an overall warmer palette. Families, on long stays may be disappointed for the Brooklyn, Deluxe and Superior suites no longer come with a pantry. Expect the new Big Apple restaurant to be a fascinating glass-walled space, with an open kitchen and plush seating. The 14th floor morphs into the new corporate 7th Avenue Lounge, fitted with check-in facilities and meeting rooms. With a lavish 29,000sq ft of meeting space, the Berjaya is well positioned to offer a range of conferencing choices with seven function rooms and a pillar-free Manhattan Ballroom that can hold up to 2,000 persons cocktail style. Meeting planners can consider this venue as among their Kuala Lumpur conference hotels choices for mid-size groups or small corporate meetings. The plus is, of course, the access to shopping and other activities for tag-along spouses and kids. In the heart of the old part of town, the Swiss-Garden Hotel is a reasonably comfortable retreat with a spa and consistently decent service. Nearby is the Impiana. Unfortunately, both of these suffer from serious traffic congestion, and not only at peak hours, due to the proximity of a major bus terminus. Taking the place of the former Pan Pacific near the Putra World Trade Centre is the Seri Pacific Hotel run by Best Western under its Premier label. 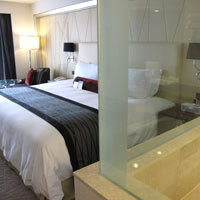 Another option is the redesigned MiCasa All Suite Hotel close by the Twin Towers where rates are attractive. In 2010 the mid-range Anggun Boutique Hotel opened right in the middle of Tengkat Tong Shin. This exotic, intimate structure – two converted 1920s Chinese shop houses – features salvaged railway sleepers for a reception desk, wooden louvered windows, custom-made colonial furniture and kerosene lamps. The hotel’s 18 rooms are no less detailed. Each room, though small, has been transformed to evoke 1960’s KL, with teak beds, locally crafted furniture, warm mahogany floors, period lights and batik. Other perks include work desks (in deluxe, family and Anggun suites), in-room electronic safe, LCD TVs, air-conditioning and ceiling fans, hairdryer, laundry, dry-cleaning and pressing services. Wi-Fi and DVD players are available to all but we are certain that you won’t use them, especially since the buzzing Changkat Bukit Bintang strip is so close by. A nice surprise is that Room 102 comes with disabled-friendly features such as lower washing basin and mirror, and lower bath seating bench. Staff is friendly and helpful. Downside – expect noise from traffic when staying in rooms facing the road; some rooms lack windows. Of course, if you really want to pummel the wallet and enjoy a manor-home experience, there was until late 2009 just one choice, the Carcosa Seri Negara, comprising two very elegant Victorian retreats in a lush garden setting. This estate was originally built in 1904 as the official residence of the then British representative. High teas, coffee in the gardens, strolls, croquet and generally a very pukka experience. Carcosa was managed for a while by the Singapore-based General Hotels Management, or GHM and returned late 2009 to the government fold. The Saujana Kuala Lumpur is a 40-minute drive from Kuala Lumpur International Airport and within striking distance of town. The resort hotel features 386 swish rooms and suites in an elegant lowrise development. Facilities include a spa, jogging track and golf. The rooms have Broadband access. Set in lush gardens with 210 rooms and two championship golf courses at its doorstep, the hotel’s Executive Deluxe Rooms and Executive Suites feature minimalist interiors with Burmese teak, parquet flooring, and elegant dark-wood tones. Another plush though somewhat out-of-the-way option is the sumptuous Palace of the Golden Horses, which is an interesting convention or golf location. Both the Palace and the neighbouring family-friendly Mines Wellness Hotel offer good value rates on weekends and are right next to the Selangor Turf Club where the races are held. Palace of the Golden Horses is stately and extraordinarily plush – or obscenely ornate in a sort of Chinese Rococco style – depending on your point of view. There is marble with intricate inlay everywhere and imposingly huge bronze sculptures of horses adorn the entrance, lobby, lagoon and cafe. 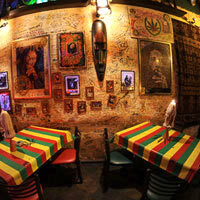 With all its flourishes, Moorish design and copper-green cuppolas – that spring to life when the lights come on after dark – the place offers much ambience and style. Service is friendly. The food needs to be brought up a notch or two. If you're here with the family, it's likely you'll be swinging out on the adjacent championship golf course (if you booked a suite). This is a membership course. Palace is favoured by the government for official functions and is a good Kuala Lumpur conference hotel choice. Both Palace and Mines are child friendly hotels and cater for the younger set. If the missus comes along, she's bound to give Gardens Hotel a solid thumbs up – it's extremely handy for shopping. Located within the Mid Valley City, it's connected to the city's top-notch Gardens shopping mall, and has 448 elegantly furnished rooms with flora and fauna adorning its walls (in keeping with the garden theme). Rooms come with standard facilities but what you'll care for, after a long flight, is the spacious bathroom with a large bathtub and rain shower. Be sure to call room service for a selection of their pillow menu just in case yours doesn't measure up. Ask for late check out. You'll need the extra hours to stuff your suitcase with all your buys or for any last minute shopping. Other Kuala Lumpur hotel choices include Federal, Corus Hotel, and the Holiday Villa Subang at the old airport. Sama Sama at the Kuala Lumpur International Airport is a convenient business traveller pitstop should you not wish to do the one-hour cab ride early morning. It is linked to the airport by an air bridge and offers 403 rooms and 38 suites including a Presidential Suite all with Broadband. Boutique hotel, Jeumpa D’Ramo, alters the Bangsar landscape with its theatrical, immaculately white facade. 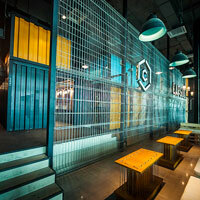 It sits at the edge of Jalan Bangkung and Jalan Maarof with a certain nonchalant authority; is self-confident and hip. 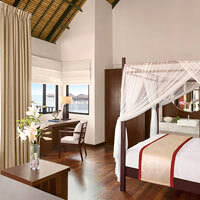 The rooms are done up in teak furnishings and opaque curtains. The real treat is the attentive staff. Along with the trademark attention to detail, this hotel feels more like a residence. Every detail is perfect – refined, low key and discreet. There are plenty of diversions too. Take a dip in the pool; lounge at the café; or head down the road to the Bangsar enclave with its one-of-a kind boutiques, galleries and sidewalk cafes. 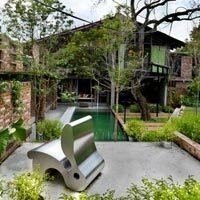 Part warehouse gallery, part retreat for guests, Sekeping Tenggiri is unlike any other digs – tucked away in a quiet residential street in Bangsar. Its architecture and design is the focal point. It goes back to basics, to nature. This typical double-storey terrace house has been cleverly converted with natural ventilation courtesy of a flying canopy of green; all doors and some timber have been salvaged from 50-year old Malay kampung (village) houses; bricks are plastered together in an attractively raw state; and there is a fashionable use of recycled material. Each of its seven rooms comes with the promise of all imaginable modern amenities such as WiFi, common lounge, swimming pool, dining area and 24-hour housekeeping service. No breakfast included. Hmm… The team behind the Sekeping retreats has put its signature mark on a pre-war heritage house on a quiet strip in Pudu. Sekeping Sin Chew Kee’s original skeleton remains intact with minimal tampering. Find two double beds and four single beds on the annexe floor. Here’s your chance to live amongst the community in this old area of Kuala Lumpur. No breakfast included. Boutique hotel Alila Bangsar (opening 2017) will serve 124 luxurious rooms bearing the signature design style linked with the Alila brand. In the residential and nightlife district of Bangsar is the hip Pullman Kuala Lumpur Bangsar (opened late 2013) serving up a bright vibe in its rooms with purple lampshades and large white-linen beds with pastel tones and grey ripple carpets. The form is mod and functional, but not over-the-top, for business travellers who like some zip in their digs. Broad city views are on tap along with an in-room safe, iron and hairdryer. There is a covered swimming pool and, for lazy afternoons, try out wellness facilities including sauna, hammam, and massage. For meeting planners and corporate suits there are 14 function and event rooms and the largest can hold up to 1,680 persons. The hotel is not very far from nightlife and entertainment possibilities and a short drive from the Mid Valley Mega Mall. The opening special is an attractive RM298 in a Deluxe Room with breakfast for two and free WiFi. The Pullman Putrajaya Lakeside Hotel is up and running – 238 rooms, suites and apartments with 21 fully equipped meeting and board rooms and a lakefront open air amphitheatre. It's all work and no play in this part of town for there are few distractions except for the hotel's five dining options. You won't mind the lack of distractions if you're staying at the Putrajaya Shangri-la – it's cool and modern with intermittent splashes of luxury that do not overwhelm. Rooms on the floor level open out onto nature and when lights go out expect the soothing sounds of running water. Expect all the amenities typical of a five-star hotel, including a courtesy car service to pick you up from Cyberjaya any hour of the day. In spite of this being a Shang, rooms have lost a bit of their former lustre. Bend it like Beckam and book yourself into the water villas of Avani Sepang Goldcoast Resort. With a copycat design of the Dubai Palms, the resort boasts 392 rooms that are tastefully furnished – contempory with warm tones and splashes of colour. If travelling with an entourage, stay at the family villa or pick the two and three-bedroom villas; each comes complete with king-size beds, LCD TV, marble bathrooms, personal safe, private balconies, and daybeds. Spectacular views over the sea, restaurants, bars and a spa just 90 minutes away from the city; what more could you want? Perhaps the 5-star quality service that sometimes is lacking at this exclusive resort. Tip: villas 5,6, and 7 have great sunset views. KLIA2 is now open and with it a new Tune Hotel. It’s the biggest Tune Hotel and it’s one of the most stylish with 400 guest rooms with direct access to the terminal via a covered walkway and link bridge. Find the typical mod-cons and extras such as a writing table, a luggage platform and 32-inch flat-screen TV. Its lobby features an open-air courtyard, with free WiFi plus a counter providing transportation services, and two AirAsia self check-in kiosks and up-to-date flight information displays for passenger convenience. A Refresher’s Package – available daily between 9am and 6pm for walk-ins only– allows you a quick nap or hot shower while waiting out your long transit. The minimalist and industrial Capsule by Container Hotel is targeted at transit travellers, backpackers and frequent flyers travelling through KLIA2, who are looking to recharge overnight. Upon check-in, guests receive an access card, locker key and an amenity bag with towel. The size of each locker is 30x23x15cm and fits most medium-size backpacks and luggage. Travellers can opt for the 3, 6 or 12-hour stay. The access card allows you entry into the sleeping zone or CapSpace, which is gender-specific. There are 79 basic mod capsules; each comes with bedding by Orthorest, two pillows and a blanket, a foldable table, hangers, personal locker, reading light, power socket and blinds for privacy. Bathrooms are shared and are divided into separate wet and dry areas; the wet area is fitted with a walk-in shower with complimentary shampoo and shower gel while the dry zone has a mirrored dressing area and toilet. There’s a Capsule Bar for a quick drink and a lounge area with free WiFi. Capsule is located within the KLIA2 complex at L1-2 and 3 of the Transportation Hub. Another option for international transit travellers is the Sama-Sama Express KLIA2- also located within the low cost international terminal. At No. 316 Jalan Tuanku Abdul Rahman (at the intersection with Jln Sultan Ismail) is the ebullient no-frills hotel Tune Hotels very much an AirAsia clone with much the same focus on high energy and Internet sales. And so it advertises, "Get a five-star sleeping experience at a 1-star price". Incredibly, rooms here start at just US$3 and up. You'll get a decent room and good showers. Tune Hotels plans setting up other limited service hotels in central locations close to shopping and dining with prices of under RM100 a night. With its signature blazing red exterior the hotel is hard to miss, more a Virgin Megastore than a dull hostelry. Indeed, the hotel insists your stay will be anything but dull. And yes, you do have laundry service, Internet stations, and a trendy cafe. This is a smart and useful downtown Kuala Lumpur budget hotel address. And if you're looking for a cheap hotel in KL, it doesn't get any cheaper than this. Yes, it's cheerful too. Old Chinese shop lots have been refurbished into the colonial yet edgy Reggae Mansion KL. 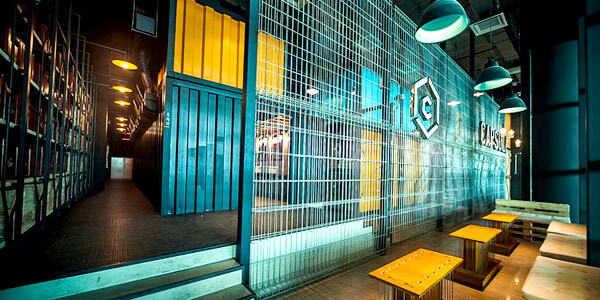 Located right in the heart of old KL, this is a trendy haunt for backpackers. Pick private rooms – either window or windowless- which prices range from RM140 to RM200 and dormitory style accommodation (RM55) that’s basic and clean. There’s a bar and lounge plus a rooftop sky bar that’s a hit with backpackers. Across the road from the Hotel Istana, the small and wonderfully seedy Lodge Hotel has returned as the Lodge Paradize Hotel, its poolside 24-hour coffee shop doing roaring business. There's the smart streetside Paradisso restaurant and tapas bar. This is a relatively cheap Kuala Lumpur budget hotel worth checking out if you are not too discriminating in your tastes - though decor has improved considerably - and require a central location in the heart of town right next to a monorail station. At the other end of the scale, if you must conserve your ringgit, a good hunting ground is the area between the Istana hotel side street and Jalan Alor. Pop into the basic but "boutique-style" Eight with its pastels and simple lines where a room will set you back just over RM95 (double). The rooms are air-conditioned and look out onto the street and there's Internet in the lounge. None of that dark dingy grime that you usually find in budget establishments. The bathrooms have showers using solar-heated water. Or head a notch downscale to Rainforest Bed & Breakfast where around RM80 will get you a room. There is aircon, some rooms have TV and the rate includes breakfast. Not all rooms have attached bathrooms. Container Hotel’s claustrophobic rooms provide limited action but you do enjoy perks such as air-conditioning, free Wi-Fi, personal bed light, towels, linen, toiletries (shower gel and shampoo) and bottled water. Modelled after the popular Kyosho Jutaku way of living, this hotel has three types of accommodation – dormitory-style with four sets of bunk beds (each with its reading light, international plug point and fresh towel) from RM35; the Adventure Room, which packs in a super single bed (but big enough for two) with a separate washroom from RM110; and the Conservative Room (for a little extra , RM165) with a double bed and a tiny en suite toilet plus a functional working area. Other facilities include personal locker, bike rental, luggage storage, lounge area and Chatime cafe. Great value for money; downside – space constraints and noise because of neighbouring restaurants. The hotel’s about a 15 minute walk from the Bukit Bintang strip. Over on Jalan Mesui, a once mouldy multi-storey building, from the ‘70s, has transformed into the 52-room Mesui Hotel. A main feature of this hotel is its circular windows within squares, all retained from the original structure. Check into the LUSH, LUXE or LOFT rooms; each provides a desk, wardrobe, air conditioning, bath or shower with free toiletries and towels, flat-screen and free Wi-Fi. Room sizes vary and so does the décor theme. Give your imagination a good stir when you stay at the Hotel Maison Boutique. It’s a somewhat whimsical experience complete with a horse-drawn carriage in your room. Choose any one of their 18-themed rooms, including Space Odyssey and Atlantis, Superstar and Fairytale. Be warned – the novelty of a themed room may wear off quickly if yours is small and windowless. In the suburb of Petaling Jaya at the Phileo Damansara office complex is the very competent and useful Eastin Hotel. You can bag a room here for a song. Weekend rates are even better with breakfast for two. There's a good dim sum Chinese restaurant. Phileo is a bit out of the way and it's unlikely you'd stay here unless you had business in the vicinity. Eastin is a good suburbia choice. A more recent five-star offering is the One World Hotel (a member of WORLDHOTELS) also in Petaling Jaya. This 438-room hotel sports contemporary décor, satellite TV, WiFi and Broadband and an in-room safe. It is close to the Utama Shopping Centre. For leisure travellers facilities include a fitness centre, four tennis courts, a pool and a spa. The 3,200sq m Grand Ballroom is a useful venue for conferencing. Take the entire family to Sunway Lagoon Resort Hotel. Its deservedly good reputation is based on excellent service, wonderful rooms and a great location. There are ample things to do at the adjacent Sunway Pyramid Shopping Mall and Sunway Lagoon Theme Park. This is a child friendly Kuala Lumpur hotel very welcoming of families. And that’s your Kuala Lumpur business hotels and offbeat stays guide from A to Z. There is usually a 10 percent service charge and five percent government tax. The exchange rate is US$1 = 3.99 Malaysian ringgit (RM). Most hotels have extended “promotional rates” that run almost year-round. Discounts may range from 20-50 percent or more off rack rates. Promotional rates fluctuate season to season. Below are some of the listed rack rates (full published price), Internet offers and promotional walk-in room prices. These prices are rule-of-thumb only so check with your agent or online. Aloft Kuala Lumpur Sentral. 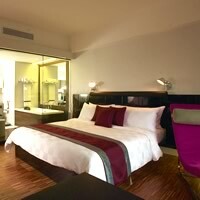 Tel: [60-3] 2723-1188, (www.starwoodhotels.com/alofthotels/). Anggun Boutique Hotel. Tel: [60-3] 2145-8003, fax: 2141-2800, (e-mail: reservations@anggunkl.com or www.anggunkl.com). Ansa Kuala Lumpur. Formerly Piccolo, Tel: [60-3] 2146-5000, fax: 2146-5001, (www.ansakualalumpur.com/). Ascott Kuala Lumpur. 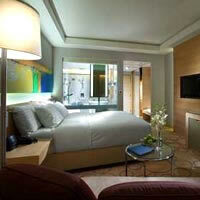 Tel: [60-3] 2142-6868, fax: 2142-9888, (e-mail: enquiry.kualalumpur@the-ascott.com or www.the-ascott.com). AVANI Sepang Goldcoast Resort. Tel: [60-3] 3182-3600, fax: 3182-3700, (email: sepang@avanihotels.com or www.avanihotels.com/sepang/). Berjaya Times Square Hotel, Kuala Lumpur. 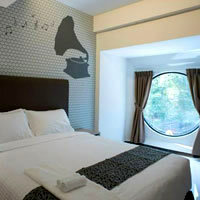 Tel: [60-3] 2117-8000, fax: 2143-3352, (e-mail: bth.rsvn@berjayahotel.com or www.berjayahotel.com/kualalumpur/). 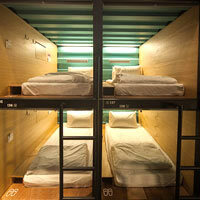 Capsule by Container Hotel. Tel: [60-3] 7610-2020, (capsulecontainer.com/). Concorde Hotel Kuala Lumpur. Tel: [60-3] 2144-2200, fax: 2144-1628, (e-mail: kl@concorde.net or www.concorde.net/kl). Container Hotel. Tel: [60-3] 7610-2020, (e-mail: info@capsulecontainer.com or www.containerhotel.com.my). Corus Hotel Kuala Lumpur. Tel: [60-3] 2161-8888, fax: 2161-2393, (e-mail: reservations@corushotelkl.com or www.corushotelkl.com). Dorsett Regency Hotel. Tel: [60-3] 2716-1000, fax: 2715-5000, (e-mail: reservations.kl@dorsettregency.com.my or www.dorsettregency.com.my). Doubletree by Hilton Kuala Lumpur. Tel: [60-3] 2172-7272, fax: 2172-7270, (doubletree3.hilton.com/en/hotels/malaysia/). Eastin Hotel. Tel: [60-3] 7665-1111 fax: 7665-9999, (e-mail: info.pj@eastin.com or www.eastin.com). Four Seasons Hotel Kuala Lumpur. (press.fourseasons.com/news-releases/). Fraser Place Kuala Lumpur. Tel: [60-3] 2118-6288, fax: 2118-6388, (e-mail: reservations.kualalumpur@frasershospitality.com or kualalumpur.frasershospitality.com). Fraser Residences Kuala Lumpur. Tel: [60-3] 2191-0888, (e-mail: reservations.klcc-kualalumpur@frasershospitality.com or klcc-kualalumpur.frasershospitality.com). Grand Hyatt Kuala Lumpur. 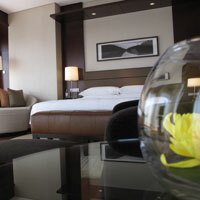 Tel: [60-3] 2182-1234, (e-mail: kualalumpur.grand@hyatt.com or kualalumpur.grand.hyatt.com). Grand Millennium Kuala Lumpur. Tel: [60-3] 2117-4888, fax: 2142-1441, (e-mail: reservations@grandmillenniumkl.com or www.millenniumhotels.com). GTower Hotel. Tel: [60-3] 2168-1919, fax: 2168-1818, (e-mail: info@GTowerHotel.com or www.gtowerhotel.com). Hilton Kuala Lumpur Hotel. Tel: [60-3] 2264-2264, fax: 2264-2266, (e-mail: kuala-lumpur@hilton.com or www.hilton.com). Holiday Villa Hotel & Suites Subang. Tel: [60-3] 5633-8788, fax: 5633-7449, (e-mail: hvs@holidayvillasubang.com.my or www.holidayvillahotelsubang.com). Hotel Istana Kuala Lumpur. Tel: [60-3] 2141-9988, fax: 2144-0111, (e-mail: general@hotelistana.com.my or www.hotelistana.com.my). Hotel Maya. Tel: [60-3] 2711-8866, fax: 2711-2277, (e-mail: info@hotelmaya.com.my or www.hotelmaya.com.my). Hotel Maison Boutique. Tel: [60-3] 2145-2929, fax: 2142-8399, (e-mail: info@hotelmaison.com.my or www.hotelmaison.com.my). Hotel Novotel Kuala Lumpur City Centre. 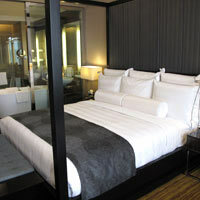 Tel: [60-3] 2147-0888, fax: 2147-0889, (e-mail: info@novetelklcitycentre.com or www.novotel.com). Hotel Pullman Kuala Lumpur City Centre Hotel and Residences. Tel: [60-3] 2170-8888, fax: 2170-8999, (www.pullmanhotels.com/). Hotel Stripes Kuala Lumpur. Tel: [60-3] 2038-0000, (www.stripeskl.com/index.html). Impiana KLCC Hotel. Tel: [60-3] 2147-1111, fax: 2147-1100, (e-mail: info.klcc@impiana.com or kualalumpurhotels.impiana.com.my). InterContinental Kuala Lumpur. Tel: [60-3] 2161-1111, fax: 2161-1122, (e-mail: reservation@intercontinental-kl.com.my or www.intercontinental-kl.com.my). Invito Hotel Suites. Tel: [60-3] 2386-9288, fax:  2386 9299. Jeumpa D’Ramo. Tel: [60-3] 2094 4522, (e-mail: amandasanusi@jeumpa.com.my or www.facebook.com/jeumpadramo). JW Marriott Hotel Kuala Lumpur. Tel: [60-3] 2715-9000, fax: 2715-7000, (www.marriott.com). Lanson Place Ambassador Row Residences, Kuala Lumpur. Tel: [60-3] 4253-2888, fax: 4253-1773, (e-mail: enquiry.arkl@lansonplace.com or ambassadorrow.lansonplace.com). Lanson Place Bukit Ceylon Serviced Residences. Tel: [60-3] 2725-8888, (bukitceylon.lansonplace.com). Le Méridien Kuala Lumpur. 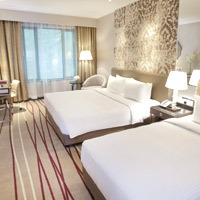 Tel: [60-3] 2263-7888, fax: 2263-7222, (e-mail: lemeridien.kualalumpur@lemeridien.com or www.lemeridienkualalumpur.com). Lodge Paradize Hotel. Tel: [60-3] 2142-0122, fax: 2142-1289, (e-mail: hotel@lodgeparadize.com or www.lodgeparadize.com). Mandarin Oriental, Kuala Lumpur. Tel: [60-3] 2179-8818, fax: 2179-8659, (e-mail: mokul-reservations@mohg.com or www.mandarinoriental.com/kualalumpur/). Meliá Kuala Lumpur. 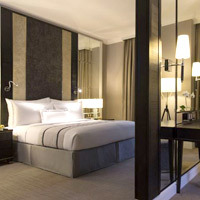 Tel: [60-3] 2785-2828, fax: 2785-2818, (e-mail: melia.kuala.lumpur@melia.com or www.meliakualalumpur.com.my). MiCasa All Suite Hotel. Tel: [60-3] 2179-8000, fax: 2161-1186, (e-mail: infokul@micasahotel.com or www.micasahotel.com). Mines Wellness Hotel. [60-3] 8943-6688, fax: 8943-5555, (e-mail: enquiry@mwh.com.my or www.mineswellnesshotel.com.my). Number Eight. Tel: [60-3] 2144-2050, fax: 2144-4250, (e-mail: reservations@numbereight.com.my or www.numbereight.com.my). One World Hotel. Tel: [60-3] 7681-1111, fax: 7681-1188, (e-mail: reservations@oneworldhotel.com.my or www.oneworldhotel.com.my). Palace of the Golden Horses. Tel: [60-3] 8946-4888, fax: 8943-2666, (e-mail: enquiry@pgh.mines.com.my or www.palaceofthegoldenhorses.com.my). Parkroyal Kuala Lumpur. Tel: [60-3] 2147-0088, fax: 2147-0099, (e-mail: reserve.prkul@parkroyalhotels.com or www.parkroyalhotels.com). Parkroyal Serviced Suites Kuala Lumpur. Tel: [60-3] 2084-1000, fax: 2084-1010, (www.parkroyalhotels.com). Pullman Kuala Lumpur Bangsar. Tel: [60-3] 2298-1888, fax: 2298-1999, (e-mail: H7962@accor.com or www.pullmanhotels.com). Pullman Putrajaya Lakeside. Tel: [60-3] 8890-0000, fax: 8890-0001, (e-mail: info@pullmanputrajaya.com or www.pullmanputrajaya.com). Putrajaya Shangri-la. Tel: [60-3] 8887-8888, fax: 8887-8889, (e-mail: slpt@shangri-la.com or www.shangri-la.com/kualalumpur/putrajayashangrila/). Rainforest Bed & Breakfast. Tel: [60-3] 2145-3525, fax: 2145-3527, (e-mail: rainbnb@streamyx.com or www.rainforestbnbhotel.com). Renaissance Kuala Lumpur Hotel. Tel: [60-3] 2162-2233, fax: 2163-1122, (www.marriott.com). Sekeping Sin Chew Kee. Tel: [60-17] 207-5977 (email: manager@sekeping.com or www.sekeping.com/sck/). Sekeping Tenggiri. Tel: [60-17] 2075-977, fax: [60-3] 7958-6375, (e-mail: bookinlog@gmail.com or www.sekeping.com/tenggiri/). Seri Pacific Hotel Kuala Lumpur. Tel [60-3] 4042-5555, fax: 4041-7236, (e-mail: resv@seripacific.com or www.seripacific.com). Shangri-La Hotel, Kuala Lumpur. Tel: [60-3] 2032-2388, fax: 2070-1514, (e-mail: slkl@shangri-la.com or www.shangri-la.com/kualalumpur). Sheraton Imperial Kuala Lumpur Hotel. Tel: [60-3] 2717-9900, fax: 2717-9999, (e-mail: reservations.imperial@sheraton.com or www.sheratonimperialkualalumpur.com). Sunway Resort Hotel & Spa. Tel: [60-3] 7492-8000, fax: 7492-8001, (e-mail: enquirysrhs@sunwayhotels.com or kualalumpur.sunwayhotels.com). Swiss-Garden Hotel Kuala Lumpur. Tel: [60-3] 2141-3333, fax: 2141-5555, (e-mail: resvns_sghkl@swissgarden.com or www.swissgarden.com/hotels/sghkl/). The Federal Kuala Lumpur. Tel: [60-3] 2148-9166, fax: 2148-2877, (e-mail: reservations@federal.com.my or www.fhihotels.com). The Gardens Hotel & Residences. Tel: [60-3] 2268-1188, fax: 2284-8998, (e-mail: infokul@gardenshtlres.com or www.gardenshtlres.com). The Majestic Hotel Kuala Lumpur, Autograph Collection. Tel: [60-3] 2785-8000, (www.marriott.com or www.majestickl.com). The Mesui Hotel. Tel: [60-3] 2144-8188, fax: 2144-0188, (e-mail: info@themesuihotel.com or www.facebook.com/themesuihotel). The Royale Chulan Kuala Lumpur. Tel: [60-3] 2688-9688, fax: 2688-9788, (e-mail: info@theroyalechulan.com.my or www.theroyalechulan.com.my). The Ritz-Carlton, Kuala Lumpur. Tel: [60-3] 2142-8000, fax: 2143-8080, (e-mail: kulrz.leads@ritzcarlton.com or www.ritzcarlton.com). Also The Residences (from Ritz-Carlton). The Saujana Hotel, Kuala Lumpur. Tel: [60-3] 7843-1234, fax: 7846-2789, (e-mail: info@thesaujana.com or www.thesaujana-kualalumpur.com). The St Regis Kuala Lumpur. Tel: [60-3] 2727-1111, (www.starwoodhotels.com/stregis). The Westin Kuala Lumpur. Tel: [60-3] 2731-8333, fax: 2731-8000, (e-mail: twkl.reservations@westin.com or www.thewestinkualalumpur.com). Traders Hotel Kuala Lumpur. Tel: [60-3] 2332-9888, fax: 2332-2666, (e-mail: thkl@tradershotels.com or www.shangri-la.com/kualalumpur/traders/). Tune Hotels – Downtown KL . Call Centre – [60-3] 7962 5888, (e-mail: enquiry@tunehotels.com or www.tunehotels.com/my). Villa Samadhi. Tel: [60-3] 2143-2300, (e-mail: reservations@villasamadhi.com.my or www.villasamadhi.com.my). Wolo Bukit Bintang. Tel: [60-3] 2719-1333, fax: 2719-1388, (e-mail: info@thewolo.com or www.thewolo.com).